Tonight I attended as a guest of Gov. Julianne Ortman (NQY: not quite yet) the Lincoln Reagan dinner hosted annually by the Minnesota Republican Party. Remember them? It was held at the hotel which most resembles Stalin, the Minneapolis Hilton Hotel. NO floor contains a bike path. Can you believe it? The dinner represents pretty much the people who don't necessarily need nor want to get into the State Central Committee but influence it as much as possible. Think of the Minnesota Republican Party a fish out of water, gasping. Yet it was anything but tonight. The highlight came without warning from a man most of the crowd had either written off or didn't know of really to begin with. With my friend Pat Shortridge, I'm somewhere in between. However, he'll most likely return my calls whenever for a decent time in the future. Send the bill to Golnik. But Shortridge didn't make his place in party history tonight by talking about the future. He talked about the recent past. Shortridge rubbed our noses in it. Almost without knowing it, Shortridge said outloud about ourselves publicly what his audience had been saying to each other for some time. "Standing ovation when Pat Shortridge calls out republicans for allowing our divisions to cause Coleman & Emmer to lose #Truth #LincolnReagan"
My friend, the most competent non-elected Republican woman in Minnesota, Leslie Rosedahl and I discussed who stood first for that comment. Shortridge suggests he'll have more to say Saturday, when press are allowed in. I'm doubtful. Tonight's significance escaped even him. 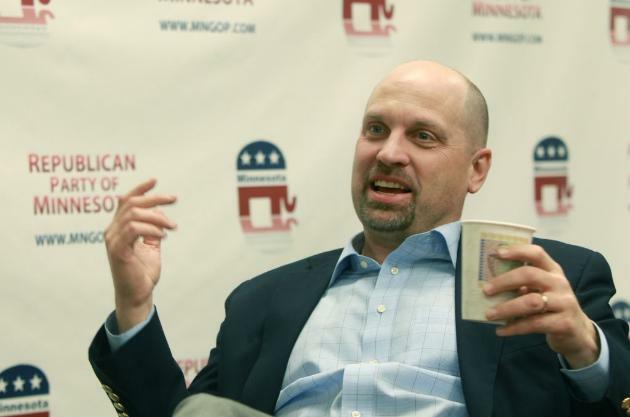 Why Can't Minnesota Republicans Message?